Your ticket to history: Join us in Orange County, California for the Inauguration of Barack Obama as President of the United States. 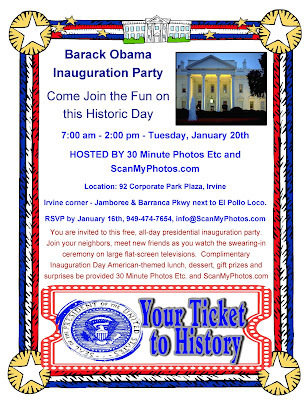 Not everyone can make it to Washington, D.C. to attend the presidential inauguration, but you can still be part of history and participate by attending a free Inauguration Day party in Irvine, hosted by 30 Minute Photos Etc. and ScanMyPhotos.com. 30 Minute Photos Etc. and ScanMyPhotos.com, the southern California-based retail and ecommerce photo imaging company are hosting a free, all-day presidential inauguration party beginning at 7:00 am on Tuesday, January 20th. Join us and view all the events and the swearing-in ceremony on large flat-screen televisions. Complimentary Inauguration Day American-themed lunch, dessert, gift prizes and surprises will be provided. Must RSVP before January 16th by calling: 949-474-7654. "While mindful of our nation’s challenges and sensitive economic state, this is a time for everyone to come together and celebrate an historic, new beginning. We are inviting the entire business and residential community to gather with our staff, friends and neighbors to share in this historic moment," explained Mitch Goldstone, president and CEO of ScanMyPhotos.com. During the election campaign, ScanMyPhotos.com formed "Entrepreneurs Support Obama" so companies can stand united and share their support and voice." See link. To get ready for this historic day, ScanMyPhotos.com recommends that all guests view President-Elect Barack Obama’s Victory Speech. See link.